One of the most attractive American atlas maps of New York City to appear in the mid-19th century. This hand colored map of New York City is a lithograph engraving, dating to 1850 by the American mapmaker S.A. Mitchell Sr. The map epicts the island of Manhattan from 37th street (Kips Bay) south to Battery Park and Brooklyn from Williamsburg to Columbia St. The whole is shown in magnificent detail with many important buildings, ranging from the Brooklyn Naval Yard to important hotels and churches, depicted and labeled. 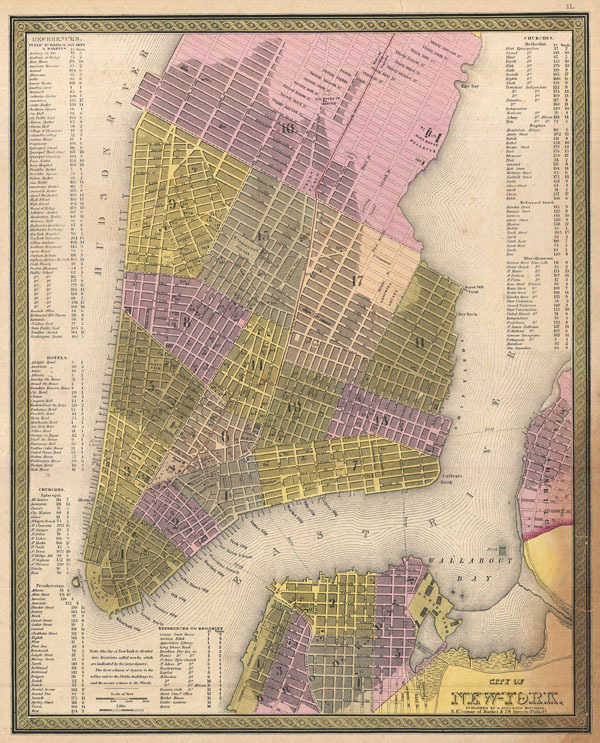 One of the most visually appealing maps of New York City to emerge from the workshops of a mid-19th century American cartographer. Very good condition. Blank on verso. Minor toning in the lower right quadrant - see image. A few marginal verso repairs of closed tears. Else a clean example. Rumsey 0537.012. Phillips (Atlases) 6103-11. Haskell, D. C., Manhattan Maps: A Co-operative List, 901.